Short and simple passing and shooting drill this week. Speed Pass/Shot focuses on specific skills and keeps the drill simple to enhance a players ability to dial in on a few specific things. The main skills? Listed in the drill title. Place a player on each of the three neutral zone lines. 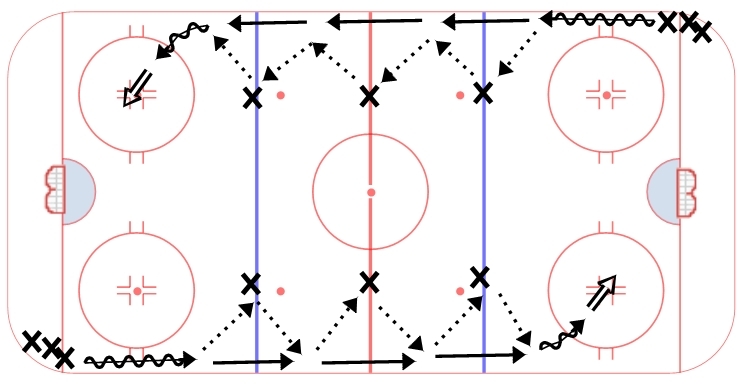 Player 1 takes off with a puck, give and go exchange with each player, then accelerate into a shot on net. While the drill itself and the execution is simple, it is the skills worked on that are important. Players should focus on keeping their feet moving at a high tempo the entire time. They should focus on their ability to pass and receive, and transition from receiving to passing quickly (all while moving their feet). Finally, they should focus on the execution of attacking the net with speed and getting off a quick release with their feet moving. Players should complete this drill with their heads up and presenting extremely good targets for their teammates. While it is a simple drill, when executed properly and at a high tempo it will improve a players ability to pass and receive, as well as shoot on the move.